Citing RS Kalsi, Senior Executive Director (Marketing & Sales), Maruti Suzuki, a new report from The Economic Times says that Maruti Suzuki has received 23,000 bookings for the 2018 Ertiga since launch. The high demand for the MPV should boost sales in the final quarter of the financial year. The high demand for the 2018 Maruti Ertiga should boost the company's Q4 FY2019 sales without hurting margins. Maruti Suzuki launched the 2018 Ertiga in India exactly a month ago. The company and its suppliers have invested over INR 900 crores towards the development of the second generation model. Moving ahead, it plans to introduce a CNG option by May 2019, launch a plusher, 6-seat version sold through the NEXA channel and rollout the E15A 1.5-litre diesel engine coupled to a 6-speed manual transmission. MSIL has not confirmed any of these variants. Introduced in April 2012, the Maruti Ertiga remains the sole offering that sells in volumes in its segment even today. It is seen as a smaller and significantly more economical model compared to the Mahindra Marazzo and the Toyota Innova Crysta. It is available with features like projector headlamps, LED tail lamps, second-row seat with one-touch fold and slide mechanism, 4.2-inch colour MID, automatic climate control and 7-inch touchscreen infotainment system with Apple CarPlay, Android Auto and Mirror Link. The 2018 Maruti Ertiga is available in ten different configurations, with prices starting at INR 7,44,000* and going up to INR 10,90,000*. 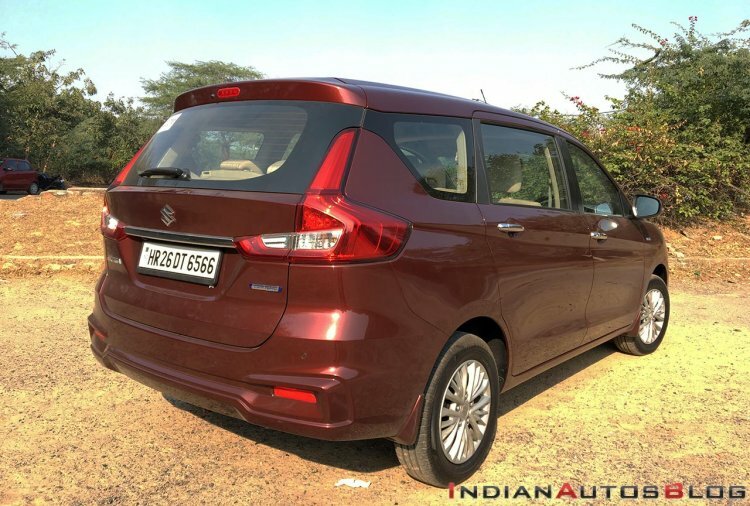 The 2018 Maruti Ertiga is 4,395 mm long, 1,735 mm wide and 1,690 mm high. It offers 209 litres of boot space, which is expandable up to 803 litres. Two engine options are available: K15B 1.5-litre petrol (104.70 PS/138 Nm) and D13A 1.3-litre diesel (89.74 PS/200 Nm). The new Smart Hybrid dual-battery mild-hybrid system is standard. The petrol engine is married to a 5-speed manual transmission or a 4-speed automatic transmission. The diesel engine is coupled to the former as standard.